Simon Sinek is an author and motivational speaker who has dedicated his life to studying leadership and movements. He is the author of four books, including Start With Why. He studied law at London's City University and has a BA in cultural anthropology from Brandeis University. On the show today - Inspired To Action, ideas about rallying people to a cause bigger than themselves and building that into a movement. SIMON SINEK: Movement is when people move, when they choose to go from here to there. 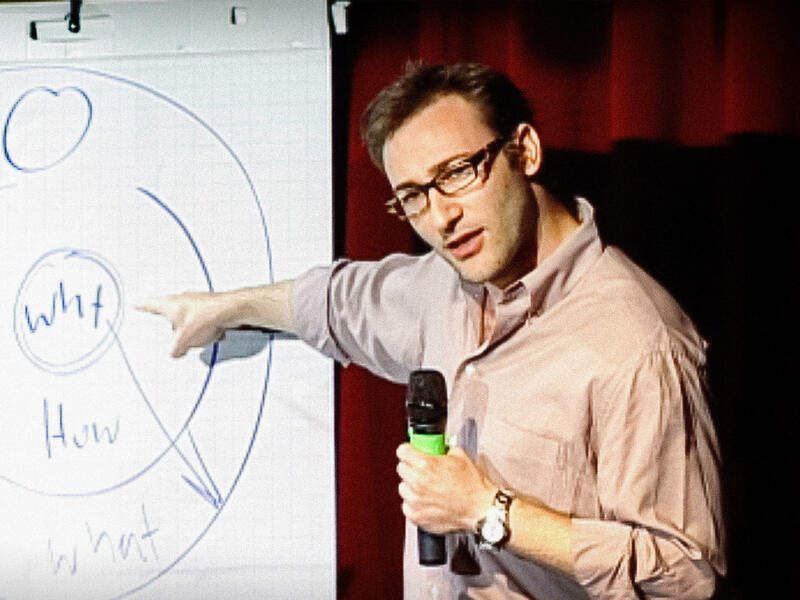 RAZ: This is Simon Sinek. He's a behavioral researcher and author of the book "Start with Why." SINEK: And here to there can be defined in any way, whether it's social change or political change or the manner in which we conduct business but that the people choose to change the way we do things from this to that. So yeah, movements can come from anywhere, but they have to be voluntary. RAZ: So why do some of them work and others don't? SINEK: Well, I am interested into why people do what they do. And why is it that certain times and certain people are able to move others? You know, there was plenty of civil rights violations prior to Martin Luther King. And there was no shortage of knowledge and personalities who knew what needed to be done. And there were even great orators prior to Martin Luther King. So how come it took until the 1960s for the movement really to grip? MARTIN LUTHER KING JR.: I have a dream that, one day, this nation will rise up, live out the true meaning of its creed. We hold these truths to be self-evident, that all men are created equal. SINEK: And I think a large part of it is, remember, as social animals, communication is important to us. And how things are expressed really matters. And we can scare people into doing things. And though they may act, it's not sticky because we don't know what we stand for. We only know what we stand against. And so I found remarkable the way Martin Luther King spoke to us. He spoke in terms of what the future looks like in a positive way, in terms so clear that we could imagine it with him. KING JR.: My four little children will one day live in a nation where they will not be judged by the color of their skin but by the content of their character. I have a dream today. SINEK: He didn't just simply show up and rail against, you know? He spoke for a different world, how to go from here to there. And he so beautifully described what there is. KING JR.: I have a dream. SINEK: And I think the great leaders, regardless of where they come from and whether it's social change or business change, they are really expert at describing where we're going, what here to their looks like. RAZ: Here's Simon Sinek on the TED stage. SINEK: In the summer of 1963, 250,000 people showed up on the Mall in Washington to hear Dr. King speak. They sent out no invitations, and there was no website to check the date. How do you do that? Well, Dr. King wasn't the only man in America who suffered in a pre-civil-rights America. In fact, some of his ideas were bad, but he had a gift. He didn't go around telling people what needed to change in America. You know, he went around and told people what he believed. I believe, I believe, I believe, he told people. And people who believed what he believed took his cause, and they made it their own, and they told people. And some of those people created structures to get the word out to even more people. And lo and behold, 250,000 people showed up on the right day on the right time to hear him speak. How many of them showed up for him? Zero. They showed up for themselves. It's what they believed about America that got them to travel on a bus for eight hours to stand in the sun in Washington in the middle of August. It's what they believed. And it wasn't about black versus white. Twenty-five percent of the audience was white. Dr. King believed that there are two types of laws in this world, those that are made by a higher authority and those that are made by men. And not until all the laws that are made by men are consistent with the laws that are made by the higher authority will we live in a just world. It just so happens that the civil rights movement was the perfect thing to helping bring his cause to life. We followed not him - not for him but for ourselves. And, by the way, he gave the "I Have A Dream" speech, not the I have a plan speech. RAZ: What is it about, like, human nature that motivates us to action? Is it - do we need to be inspired? SINEK: We're tribal animals. And one of the things that ensures the success of the tribe - and indeed, the species - is our sense of belonging. And belonging comes from a common sense of values and beliefs. And sometimes those things are understood, but they start to have scale - the ability to scale when they're directed and when someone does actually lead us and can articulate where we're going. RAZ: And so when we think about great movements like the civil rights movement or the anti-apartheid movement in South Africa - right? - or even a movement like the Russian Revolution - right? - I mean, there were leaders who inspired people to take action. How - like, what does a leader have? Why do some people have that ability to inspire? What is it that they have? SINEK: Well, first of all, they have deep undying belief in something bigger than themselves. And the best leaders are actually the best followers because they don't see themselves as the thing to be followed. They actually see themselves as following a cause bigger than themselves. They actually see themselves in service to something else. It's the rest of us who choose to follow them. RAZ: In just a moment, why the world could use more of those kinds of leaders and what it takes to become one. On the show today, Inspired To Action. I'm Guy Raz, and you're listening to the TED Radio Hour from NPR. RAZ: It's the TED Radio Hour from NPR. I'm Guy Raz. And on the show today, Inspired To Action. And just before the break, we were hearing from author and behavioral researcher Simon Sinek. And Simon was explaining why certain movements like the civil rights movement inspire people to change the world and why others never seemed to catch fire. SINEK: The ones that fizzle out, I think, very often were driven by marketing and money. In other words, it's a little bit like advertising, you know. Companies know that if you spend money on advertising, you'll see your sales go up. And if you stop spending money on advertising, you'll see the sales go down. SINEK: And I think the movements that survive are the ones that are driven by the people and people who hear a vision of the future that they believe in. They find some sense of belonging. They take that cause and make it their own, and they themselves become leaders in their own communities. They themselves will choose to spread a message to other people. RAZ: You know, there are challenges that we face that are so huge - like climate change, right? I mean, climate change is something you could argue is on the order of the greatest challenges we've ever had to face, and yet it doesn't seem like the masses around the world have been inspired to take action. So why? I mean, why do you think that is? SINEK: Well, first of all, when there is change or things are different or difficult, it's easy to stoke fear. And the best way to to beat pessimism is with optimism. And I think one of the challenges that we face with all of these what should be movements but don't seem to be movements is, A, we don't know who the leaders of the movement are. Who is articulating the message? We don't have anybody who's preaching a vision of the future that is brighter and different than the one that we live in now, or they do it in terms that are really hard to understand. They're so big and so amorphous that they lose tangibility, you know? Like, make the planet better. Like, I - how do you even conceive of that? Protect the environment. And fundamentally, what makes a movement a movement is you put it into terms that are individual. Stalin allegedly said the death of one man is a tragedy, and the death of a million is a statistic. And the problem is the, quote, unquote, "leaders" of our modern movements seem to speak in statistics, and that doesn't resonate. I mean, go back to Martin Luther King. You know, I have a dream that one day little black children will hold hands on the playground with little white children. KING JR.: Little black boys and black girls will be able to join hands with little white boys and white girls as sisters and brothers. I have a dream today. SINEK: He didn't say that we will all get along and all the races will, you know, feel like they're together. He talked - you can literally imagine a little black child holding hands with a little white child on a playground. We can imagine it. SINEK: And so what we do is we use these individual stories, whether they're true or whether they're hypothetical, as metaphors for the big idea because we can relate to the small story because we can relate ourselves to the small story. SINEK: I listen to politicians now with their comprehensive 12-point plans. They're not inspiring anybody. Because there are leaders and there are those who lead. Leaders hold a position of power or authority, but those who lead inspire us. Whether they're individuals or organizations, we follow those who lead not because we have to but because we want to. We follow those who lead not for them but for ourselves. RAZ: Do you think that we are at a place - the sort of crossroads in human history where because of the dissemination of information, the access to information that paradoxically, even though we can connect in so many ways more easily than ever before, it's harder for people to rally around one thing, for massive numbers of people to rally around one thing? SINEK: What is more inspiring, you know, connecting with somebody on an online forum about common beliefs or showing up to a rally and holding hands with a stranger, hugging someone and crying in the face of injustice? It's those human experiences - to look someone in the eye, to cry with someone, to hold their hands, to show up and feel a part of something. When you show up and there are throngs of people and you don't know them, and in any other circumstance, you would never be friends with them but for the fact that they showed up - we become brothers and sisters in that moment. And those experiences inspire us to do it again. And we will get on another train or a bus or a car. And we will drive another seven and eight hours simply to stand in the sun for hours to say, I believe, I believe, I believe. SINEK: It's these incredibly human experiences that make movements move. SHUTTLESWORTH: And after a while, we'll have freedom. Freedom. Freedom now. RAZ: Author Simon Sinek. His talk about how great leaders inspire action is the third-most-viewed TED Talk of all time. You can see that and his other talk at ted.com. Transcript provided by NPR, Copyright NPR.